802.11ac wireless networks. The Netis adapter not only does reasonably well at these tasks, it also offers some useful additional features. 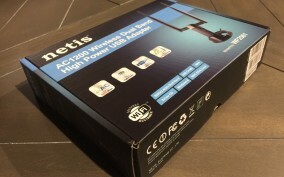 The Netis WF2561 is very easy to install and extended our wireless range almost 25ft to a dead-spot we had in our office when paired with our Linksys WRT1900AC SMART WiFi Wireless AC Router AC1900 Dual Band router ($212.00 Amazon). 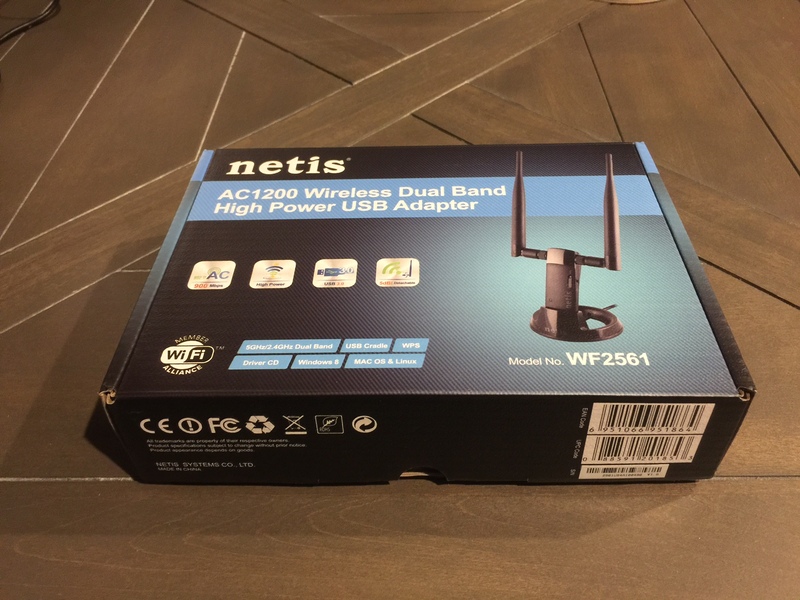 Netis WF2561 adapter is unique in that unlike most USB wireless adapters, it’s a little big with two 5dBi antennas that takes up tons of space. Luckily it does come with a USB cable letting it stand atop a desk. Its large size makes it awkward to clip to a laptop although if you are looking to extend your notebooks reach this is definitely a good option. 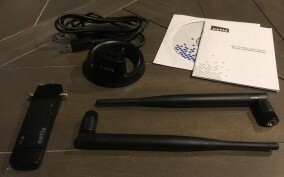 The adapter ships with a basic setup guide, Installation CD, Adapter, USB Cable, and two 5dBi antennas. In most cases it seems windows is able to automatically find a driver for the adapter, but if you run into issues the included CD has the driver ready for you. 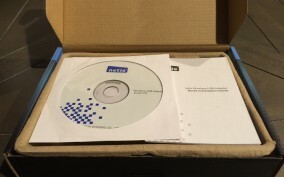 The Netis WF2561 is supported on Windows XP, Vista, 7, 8, 8.1, Linux and Mac OS X. 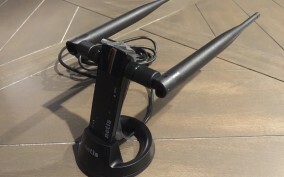 The MSI GS70 Pro notebook we use for testing already has an on-board wireless adapter (Intel Dual Band Wireless-AC 7260) and surprisingly I was pleased to see that the Netis WF2561 was detected and setup as the second Wi-Fi connection with no compatibility issues. If you are installing driver included on CD the install requires a reboot for the adapter to work properly as we experienced when using adapter on a Windows 7 system. Testing throughput and range with the Netis WF2561 versus the on-board Intel adapter in my testing client showed range improvements no matter which band I was connected to, either 2.4 or 5 GHz. 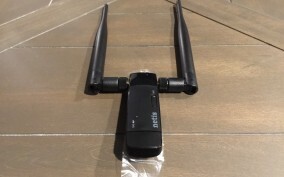 I was able to get a signal with the Netis WF2561 at distances I usually lose connectivity—about 150 feet away from the router. The signal was pretty slow at 2.4 GHz, but was still fairly speedy at 5 GHz at this distance. Where my Intel adapter did not even display a connection available. I also took the adapter home and did further testing in several dead spots around the house and I found that even though it was able to get much better range than the onboard, It does not work when plugged in to a USB 2.0 port. Instead range drops to about the same as the onboard and some networks where not even detected. 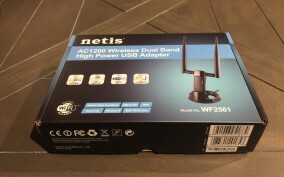 The Netis WF2561 is a good adapter to use if you have range issues or are have a wireless client with an older 802.11x adapter. Throughput was better at 5 GHz using, but performance took a hit at 2.4 GHz compared to the Intel adapter. 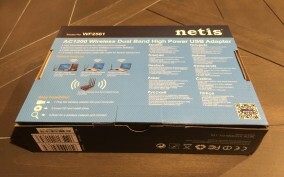 If you are looking for a USB 802.11ac adapter for a laptop or desktop that does not have wireless or just has range issues, the Netis WF2561 is a good bet, despite the performance issues at 2.4 GHz and at $49.99 the price is better than most similar product out on the market. 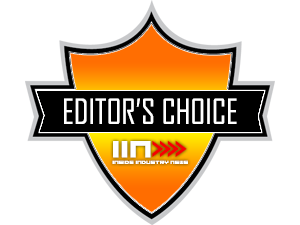 Boosts range an avg of 10ft with standard 11n routers. Soft AP mode for local network sharing. Although software could be improved. Fairly large, which makes it difficult for use with notebook or on the go. No where does it say USB 3.0 is required for range gains.